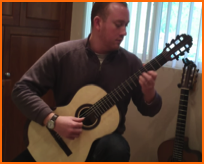 Back to "Viedos of performers"
Steve Lerman is a rapidly-rising star in the world of guitar. He has a Doctorate degree and has both won and placed highly in presigious internationl guitar competitions. His musicianship and dedication are obvious in his playing. We became friends at La Guitarra festival and when he comes to town he frequently visits. these videos are made in my home as a personal favor. Steve plays exerpt from Le Depart by Napoleon Coste on Jazz Design #93. Steve plays Leo Brouwer *An Idea" on Benedetti's #91.